The number of children who die every year in a country is an index of well-being and health of children in this country. Today, the global situation of infant mortality is tragic: Every 4 seconds a child dies. Nevertheless, the death of 22’000 children per day is not inevitable. On the contrary, solutions exist and the overwhelming majority of these deaths are easily preventable. Infant mortality is the annual number of children deaths divided by the total number of births in a given region. This is what is called the Infant Mortality Rate (IMR). 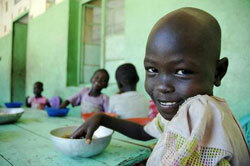 This average gives mainly information about children’s health conditions in a country. Child mortality is measured by the Child Mortality Rate, also known as under-5 mortality rate or U5MR. The U5MR has significant comparative advantages for assessing the impact of actions on the children’s survival and well-being: It is an indicator of the development assistance results, it reflects a global action focusing on several activities (immunization, safe water, maternal health, nutrition…) and is a reliable indicator of the health and well-being of the majority of children of a country. 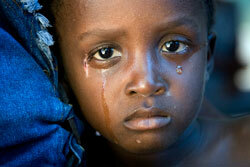 Almost 9 million of under-5 children die each year, which means that a child dies every 4 seconds in the world. But, despite this alarming report, the situation is not getting worse, it is actually improving: Between 2000 and 2010, a 35% decline in child mortality has been recorded. India, Nigeria, Democratic Republic of Congo, Pakistan, Ethiopia and China concentrate by themselves over half of the number of children dying in the world. To compare, the bloodiest war in the History of Humanity,Worl War II, reported a death toll of more than 60 million dead which, spread over 6 years, represents more than 10 million deaths per year. At that time, more than 20 million children died each year. So, the child mortality has been comparatively more deadly than the most terrible war of Humanity. preventable if governments decided to make children a budgetary priority. Lack of oxygen at birth (8%). Many factors combine themselves and increase child mortality, particularly undernutrition which is responsible for 50% of child deaths worldwide. For instance, almost 27 million children are still deprived of the most important vaccines: 1.4 million of them die each year from diseases against which vaccines exist. Global immunization campaigns have already achieved significant progress: In Vietnam, thanks to widespread vaccination against measles, child mortality has dropped by half since 1990. Far from being an overwhelming scourge, high child mortality can be greatly reduced as shows the 35% decline in U5MR recorded during the last decade. The United Nations has set the reduction of child mortality as the « Millennium Goal » with the hope of reducing by two thirds the 1990’s mortality rate level by 2015.